Selling at JBF in 3 steps! JBF Elk Grove Consignors earn an average of over $300 at each sale! There is no limit to the number of clothing and other "stuff" you can sell. Use your smartphone or mobile device to tag. It's so easy! Check out our NEW Sweet 16 Program! Earn 70% us to 80% with opportunity to waive your fee! Details in the Flyer! IMPORTANT NOTE: All Consignors picking up unsold items at the end of the event help 2 hours at breakdown. Please add a shift to your schedule. We need lots of hands to sort items for pickup. This 2 hours of help counts towards Team Member credit. Just 2 more hours of help at breakdown or during the sale and your profits increase to 65%! Can't help at breakdown, you can arrive early to pickup your items on Saturday before closing (by NOON) and you don't have to help at breakdown or, we can do it for you for $20 fee. Too busy to tag? Try our Valet Tagging Service (info below)! Need cash now? Can't wait for the event? Check out JBF On Demand (info below)! 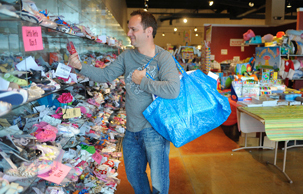 Over 100 helpers make each sales event the perfect place for families to find great deals on items thye need! Please note: all JBF Team Members must consign at least 15 items to help at the event. Which Presale Pass do you want? The more you help, the earlier you shop! All JBF Team Members SHOP EARLY at Wednesday's Presale AND SHOP EARLY at Friday's Half Price Presale. To become a Team Leader, just SIGN UP for 4 hours during SET UP, 4 hours during BREAKDOWN and 4 hours any other time during the event. You can have great fun helping at a JBF event, and be appreciated for what you do! Find more items? Bring anytime during the event! Just check in at the registers first. Bring your items tagged and sorted by type & size by zone. STEP 1 - Check in at the Consignor Registration Table - Make sure to mention if you have any Sweet 16 items at check in to receive 80% profit on the sale of those SWEET 16 ITEMS! - Verify your 2 hour help shift to pickup sorted items or schedule an EARLY PICKUP time, add shifts to increase your sales profits. - Pick-up your Presale Passes. ZONE DROP OFF - The first 3 (blue) zones are self serve areas (hang your hanging baby items like diaper bags/car seat covers/slings/shopping cart covers, hang clothes is sizes, set up large items, tag large items with a yellow large item tag, and set up, if needed (cribs, play pens, furniture items) Zones 4-5 (coral) will be a simple drop off at the labeled tables. Collect any non-hanging items and check the clothing racks for hanging items. Check the missing/loose tags/rejected items area for your items. Turn in your signed FORM with your JBF Pickup Buddy on your way out. All remaining items not picked up by 9:00pm will be donated to the Sacramento Food Bank & Family Services. Let us prep your items for you! We prep your items and you earn 40-50% profit (60% on Sweet 16 items), less a $15 Consignor Registration/Supply Fee! As a JBF Consignor, you are able to SHOP EARLY at the Donating Consignor's PRESALE with 1 guest. All items Valet Tagged must go 1/2 price and will be marked DONATE (a donation receipt will be provided). JBF Tagging Helpers place fair market pricing on all items. 1. Do you have at least 100 items to sell? 3. If Valet Tagging were not an option, would it be impossible for you to participate in the next JBF sales event? EMAIL HELPME@jbfsale.com to get an application and complete details about the program. Register for the coming event by clicking REGISTER TO CONSIGN at the link above and choosing the Elk Grove event as a Consignor. Print and fill out a Valet Tagging Waiver. We will contact you to confirm your spot and schedule merchandise drop off. Make sure all pieces are present and items have working batteries (we can provide batteries at $1 ea). Place items in bags or boxes that do not need to be returned. Gather hangers for your clothing items and blankets (supply fee covers all other supplies - we can provide hangers 8 for $1). Arrange a drop off with your local tagging helper. • ANYTHING that has to do with raising a newborn to a tween! We sell children's clothing Newborn through size 20 as well as all maternity sizes. Our All Season Sale will accept both summer and winter clothing. Be picky. Look at your clothing items as if you were going to purchase them. No stained or damaged items will be accepted. We do not accept misses or women's clothing. Please freshly clean your clothing items. Please button all buttons, snap all snaps, zip all zippers before you arrive at drop off. The newer the item looks (and the better it smells), the better it will sell. Package & Hang: Hangers - Please hang clothes so the hanger hook points to the left (like a question mark). Hang size 0-6 clothing on child-size hangers and sizes 7-20 and maternity clothing on adult-size hangers. Old Navy and many outlet stores are great places to get free hangers (they throw away hangers daily!) and WalMart & Target sell child-size plastic tube hangers at a great price. JBF sells child size wire hangers 100 hangers for $12. EMAIL US if you need to purchase hangers. Clothing Sets - Sets tend to sell better (under size 6) so match things up if you can. All garments should be hung with the hanger hook pointing left (hanger should resemble a question mark when looking at the front of item). Safety pin to attach clothing sets securely with bottom garment hung on the backside of the shirt, so both pieces can be viewed without separating them. Pants/Shorts/Skirts - Pant-clip hangers are great but if you use a standard hanger, simply use a safety pin to attach pants to the top part of the hanger so the garment will not slide. Non-Hanging Items - Onesies, socks, tights, hats and infant mittens need to be in a clear zip-lock bag (you may group multiple items in one bag). Please be sure to label your tag well so that customers know if the items are short-sleeve onesies or long-sleeve onesies. Price: Hanging Clothing - Put outfits/set together to price for at least $3.00; Start at $3 for basic, generic brand. 0-24mo outfit. Add $1 each for larger size, name brand, formal, and heavy/winter. Non-hanging Clothing - Put sets together to price for at least $3.00, but okay to price for less (i.e., 6 pair of socks for $1.50). Diaper bags, infant carriers, backpacks, and purses are great consignment items. Please inspect all items carefully to make sure items have not been recalled, stained, damaged or are missing pieces. We accept breast pumps and accessories, clean and in working order. Package: Please zip-tie items to an adult-size hanger for added safety. Check with a JBF Team Member at Drop Off for assistance. Tag: When tagging books, please attach your tag to the book with painter's tape that can be removed without damaging the item. Tape tag to the outside cover of books. Please do not use masking or double sided tape. Hole-punch JBF tag and tie to sets. LOOSE ITEMS include infant accessories, girl and boy accessories, and little extras such as bibs, cloth diapers, bottles, feeding bowls and spoons, bows, headbands, socks, safety items, nursing bras, etc. Package: These items can be packaged in clear ziploc bags with the tag attached to the outside of the bag with tape or a safety pin. Blankets and Hooded Bath Towels sell better if they are hung over a hanger. We do not have an area for bagged clothing items, including onesies, sleepers and pajamas. All clothing should be hung on a hanger. HOT SELLERS: Exersaucers, swings, high chairs, changing tables, cribs (Manufactured AFTER June 28, 2011; please bring a completed Crib Checklist for all cribs), strollers, bath seats, baby walkers, car seats must have a completed Car Seat Checklist & car seat accessories must be checked for safety recalls, must have all parts, and be in good condition. Don't forget children's furniture - beds (toddler, twin), desks, side tables, dressers, etc. Band/Musical Instruments are sold in working order and in cases. All loose items belonging to instruments, sheet music etc, include within ziploc bags. Tag: For items with multiple separate pieces, put a tag on EACH piece. Fill out the first tag as normal, including the price, but include " 1 of X", where X is the number of pieces. On all of the other items you can include a hand written index card. Write your consignor number, the description only, no price on the rest of the tags, and "2 of X", "3 of X" etc. ONLY put a price on one of the tags! Only use multiple tags for separated pieces; do NOT use multiple tags for items that are attached together. Turn JBF into a fundraiser for your school, troop or moms group. 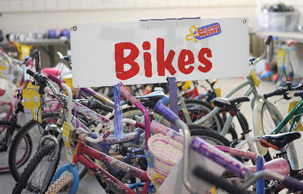 Gather donated itmes from students, friends and/or other families OR go shopping at garage sales and thrift stores. Register and tag under ONE consignor number and get check 2 weeks after each event! You can tag the items for a higher profit or send donated items through VALET TAGGING and we can tag the items for you. Email HELPME@jbfsale.com for more information. Sometimes you need the CASH. Sometimes you need the SPACE. Email HELPME@jbfsale.com if you are interested. Want to earn a higher profit %?